Mr Williams is a consultant orthopaedic surgeon specialising in foot and ankle surgery in Colchester. Find out more about Mr Williams. A Tibiotalarcalcaneal (TTC) fusion involves fixing/fusing together the ankle joint and the subtalar joint (Underankle) at the back part of the foot such that they become solid, removing the arthritis and never move again. Much like a fracture unites so the bone should grow across between the bones (Calcaneus to talus to tibia) becoming one solid structure. Tibiotalarcalcaneal (TTC) Fusion is a recognised treatment for improving the chronic pain of arthritic hindfoot and ankle joints, it can also be used for correcting deformity. It is considered in the situation where all sensible and practical non-surgical methods have failed to provide or sustain adequate quality of life with respect to pain and mobility related to the joints to be fused. A successful TTC fusion should provide significant improvement in pain and therefore mobility. Tibiotalarcalcaneal fusion has been shown to technically work in up to 75-85% of cases. This mirrors in a patient satisfaction rate of similar ball-park figures. It is not a perfect operation restoring normality. Stopping these joints from moving causes stiffness in this part of the foot and ankle. Your walking gait will be altered as you lose all ankle movement. However your overall mobility should be better as the pain is much improved. The loss of subtalar movement once fused can also mean an unsteadiness when walking on uneven surfaces long term. Physiotherapists will help you regain a new walking pattern and an Orthotist will help with shoewear advice and modifications as necessary. An example of this is the rocker bottom shoe such as MBT or Skecher’s “Shape-Ups”. During the operation skin cuts will be made in appropriate positions to allow access to the joints that need to be fused. To access the ankle the end of the fibula bone (outer ankle bone) is cut out and used for autogenous bone graft later in the procedure. Once the joints are accessed all the damaged cartilage is removed to expose healthy bone underneath. This removes the joint and stimulates the surface bone to behave as it would if broken and start to heal the joint together by making new bone. Metalwork is placed into the bones to secure and compress the old joints together and hold them in position while they unite / fuse together. This usually done with the Nail pictured above but occasionally plates and screws are used as well or instead. X-rays are used during the operation to determine that the position of the bones and the screws are correct. The metalwork usually stays in the foot for the rest of your life. Your leg is placed in a ½ cast ‘Backslab’ and the wounds closed. 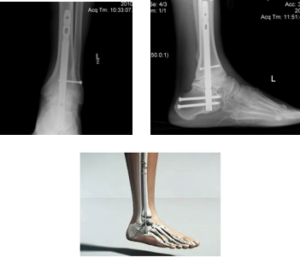 What is the ‘standard’ Hindfoot Nail Fusion recovery like? Tibiotalarcalcaneal fusion is performed as an inpatient procedure and usually under a General anaesthetic unless there are medical reasons to avoid this. It takes between 2- 3 hours to do. You will stay in for 1-2 nights, occasionally longer. What about walking after Tibiotalarcalcaneal Fusion? You will be using crutches / walking frame to mobilise during the first few weeks. Very occasionally you might require a wheelchair. Checking for signs of infection. Physiotherapy = The timing of this varies but is usually reserved for when you get out of the cast and begin weaning from the boot. For various reasons, during Hindfoot Nail fusion, its recovery or even recognised before we start , it may be necessary to stay in a full cast for over 12 weeks or more after the surgery. This will always be discussed and explanation provided. What are the downsides to tbiotalarcalcaneal fusion surgery? If you have any pains from joint arthritis in other parts of your foot or knee they may worsened by a hindfoot fusion. Your leg may be slightly shorter than the otherside but noticeable and require a small build-up of the sole of a shoe to accommodate this. What are the Alternatives to Tibiotalarcalcaneal Fusion? Bracing – Any brace that restricts the stabilising motion of the hindfoot (wigwag/side to side) and ankle will help calm the pain experienced. Subtalar Fusion and Ankle Replacement - Usually performed as staged procedures some patients are suitable for this more drawn out ambitious plan of care. In certain instances it can be appropriate to consider having a subtalar joint fusion followed 3-6months later by an ankle replacement. This will be discussed. What are the Risks of Hindfoot nail ? Tibiotalarcalcaneal fusion Surgery? This surgery carries risks as we have to cut through your skin work on the bones inside your foot & ankle. Metalwork implants are also put in to secure the bones together. The incisions are kept as small as possible to minimise these risks while being large enough to safely perform the operation. Leg length discrepancy – Because cartilage and bone are necessaryily removed from the joints to get fusion some height is lost. Usually the difference is negligible but on occasions the difference needs to be made up in footwear modification with a thickened sole for example. Thrombosis – (Deep Vein Thrombosis / Blood Clot / Pulmonary Embolism). Any operation on the leg places you at slight risk of this. A thrombosis can occur in the leg muscle veins causing pain and swelling. Pulmonary Embolism (PE) is where the leg thrombosis moves and traps in the lung which can be fatal. Take a small injection of Enoxaparin every evening that you self administer for the entire duration you are in cast. What should I do if I have a problem after the operation? I hope this guide has given you some insight into the procedure and I’m sure you understand that nothing n this style of work is exact or absolute and just is the basis of my practice. I will of course adapt the above your to you individual case and requirements and work with you for the best outcome. All example Images taken from www.google.com.